Depending on taste, "original practices" Shakespeare, which aims to replicate the bare-bones, high-energy atmosphere under which the Bard's plays were first presented, can be a dazzling experience. Similarly, the plays can entertain when offered with set elements and effects unthinkable in Shakespeare's time. One of a slew of disappointments in Queens Shakespeare's Twelfth Night, then, is the apparent picking and choosing of styles. Positioning bushes on stage behind which characters can hide as needed is fun; using a birdbath to symbolize the shipwreck that brings Viola (Anne Roser) and Sebastian (Jonathan Emerson) to Illyria is enchanting. So why is the rest of the piece visually threadbare? Indeed, the birdbath is a one-shot device for director Nanette Asher; like several of her directorial concepts—music to underscore parts of scenes, gender-bending that goes well beyond the script—it remains undeveloped. Plus, Tara Schmidt's costumes make no sense: Why suit up Brendan Hunt's smiling, beguiling Feste in a mountain of velvet while cladding other actors in unshaped sheaths like a Project Runway patch job? Perhaps one can make allowances due to this company's noble mission: assembling "professional actors in leading roles who will act as mentors for students and for community members." But it seems to me that the goal ought to be a single acting style, and here one's frustration grows very keen. Take Roser—what a very fine sense of verse she shows. The same for Danny Makalii Mittermeyer's fey, extra-whimsical Sir Toby Belch, even if he's all gussied up like Wayland Flowers bereft of Madame, and Adam Gallinat's congenially goofy Sir Andrew Aguecheek. Yet Greg Mocker as Orsino by the end of the play seemed unmoored from his lines (and at one point cued by Roser), and Nathanael Vaky played Malvolio boldly but too much for the humor, as if mistrusting Shakespeare's pen. Asher can't seem to decide between a souped-up or scaled-down Twelfth Night or among a madcap, moody, or multigender take on the play. All are possible and plausible interpretations—just not all at once and not in half-hearted half measures. Presented by and at the Flea Theater, 41 White St., NYC. June 18–27. 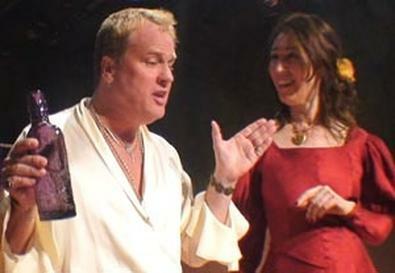 Wed.–Fri., 7 p.m.; Sat., 3 and 7 p.m. (212) 352-3101, (866) 811-4111, www.theatermania.com, or www.theflea.org.